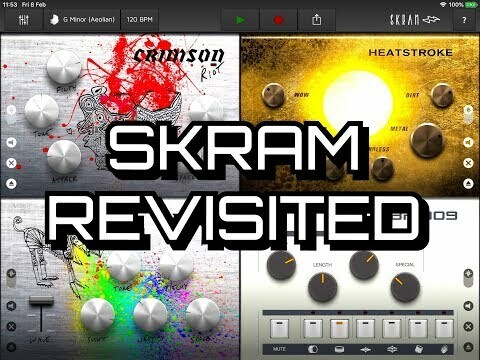 Remembering SKRAM, which still works on iOS 12 but hasn't had an update for two years, which is a real shame because this had real potential. Anyway, you can grab the basic version for Free to have a play with. Thanks Doug. This is great- for some reason when I first had this I did not like it at all. After your video I downloaded it again and this time I have taken a shine to it straight away- I’m not really sure why this has happened- but it has!- I’m just about to get the IAP’s. btw Doug- has the ‘game changer’ you spoke about a good while back been released yet? Which one was it? Or is there any news? I had issues with it recording and audio cutting out iirc. Needed a few essential tweaks but definitely had potential. I gave them great simple suggestions. It’s definitely worth a whirl- it’s only £1.99 for all the in app purchases- so that is the total price. The knobs twiddle smoothly with the Propellerhead type touch and drag assistance- it also has the whirly wheel things (that you have in Figure) so you can change your groove in an instant. It is easy- but has instructions anyway. It has Link (tap the bpm to access it). It sounds to me are very useable- and they go great with effects. If you like to have a nice groove going in AUM (I don’t think it is Audiobus compatible) with a handful of synth sequencers- or you are making clips to launch- this will definitely not be out of place- I have recorded a few bits and no issues have come up. It is also very quick to get a groove going. I like things easy and uncomplicated- and this is just that. This will definitely be getting more use than many other (and much more expensive) apps that I already have. It really is a touch of genius. Didn’t all the feature requests send the dev running for the hills? The devs had already Skramed when I first got on iOS, so I missed all that action. Anyway, I still bust out this app occasionally. It is one of the quickest, easiest funky loop makers. @CracklePot I don’t think all the feature request would have a problem for these developers, I just think they gave up in the App. Yeah, I wasn’t sure about what happened. I just got the impression that there was a ton of excitement about Skram for a bit. Then it was abandoned. I thought maybe too much excitement had something to do with it. Don’t quote me on this but, I think the dude behind Lemur and Skram got kidnapped by Korg. And he’s since worked on the Monologue and as lead dev on the Prologue, very likely the Minilogue XD as well. yes Etienne Noreau Herbert took over as chief of analog synths when Takahashi left. *edit, i should say when Takahashi stepped down not left.